Telerik RadChat for Xamarin (available since R2 2018) is a UI component that enables easy implementation of conversational UI in Xamarin applications, whether by utilizing certain chatbot framework, by following a predefined logical tree, or just for integrating P2P chat capabilities. A variety of chat items for better user experience: You could choose between simple text messages, various picker items and cards. 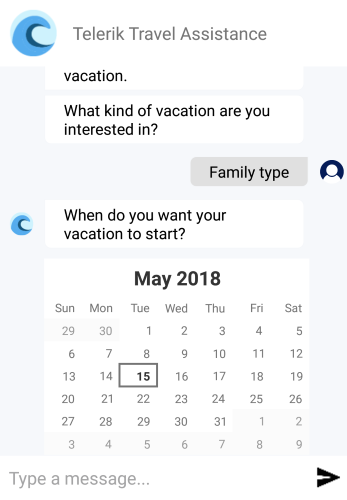 Integration with conversational UI APIs: RadChat control can be used with all the major conversational UI APIs or services such as Microsoft Bot, Google’s API.AI, Amazon LEX, and more. Theming Support: RadChat comes with built-in theming support that helps you achieve consistent look with the rest controls from Telerik UI for Xamarin suite.